An epidermoid cyst is a rare intracranial neoplasm. It is mostly found in cerebellopontine angle, suprasellar region, interhemispheric fissure, and is rarely found in other locations too. Epidermoid cyst at the parietooccipital area is rare, and calcification among epidermoids is very unusual and dystrophic in nature. The clinical presentation is usually in adults because of slow-growing nature of epidermoid cyst. 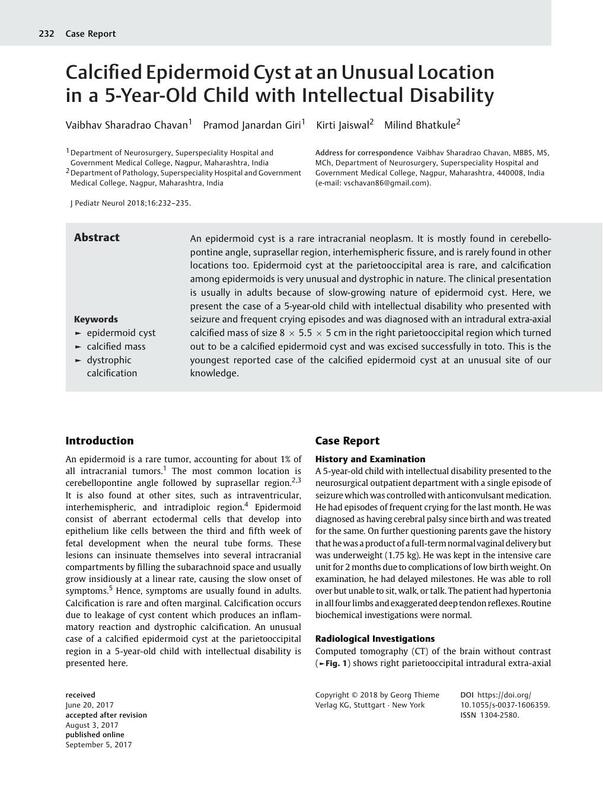 Here, we present the case of a 5-year-old child with intellectual disability who presented with seizure and frequent crying episodes and was diagnosed with an intradural extra-axial calcified mass of size 8 × 5.5 × 5 cm in the right parietooccipital region which turned out to be a calcified epidermoid cyst and was excised successfully in toto. This is the youngest reported case of the calcified epidermoid cyst at an unusual site of our knowledge.